Summer weather is here, and weeds are exploding! Well, they’re not literally exploding, but our phones have certainly been ringing off the hook. This month we feature Giant Hogweed and Tansy Ragwort. Giant Hogweed poses hazards to humans, so if you see it, please [contactweedwise]. 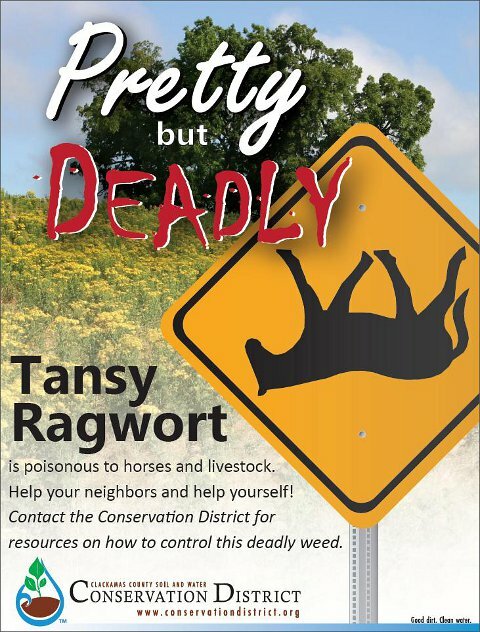 Tansy Ragwort is toxic to horses and livestock, so controlling it is important. In the Projects section, get up to date on our “3D area” water quality work and our Milk Creek project. In the Water – Weeds – Wildlife section, we focus strongly on weeds this month. We have a few new weed-removing tools available to loan out. We also report on work in Mt. Scott Creek and habitat needs in a side channel to the Salmon River. We visited a site on the Molalla River that is experiencing excessive erosion, and along Clear Creek we’re part of a collaborative effort to restore native habitat. We met with watershed councils in June and learned that many of them are having as much trouble as we are in finding the right woody material for stream restoration projects. 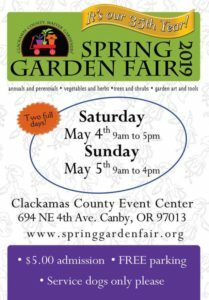 Two items are coming up fast: the Clackamas County Fair in August, and Small Farm School in September. We look forward to seeing you at one or both of these great events! Small Farm School Registration is Open!